I hope all of you had wonderful holidays. We had a big Prime Rib dinner with all the trimmings. It was a great evening with family. In the morning my mom and I joined my brother and his family to watch the kids open presents. It was fun to watch their anticipation. We played Lego Rock Band and laughed a great deal. There are so many recipes I tried out but never posted before the craziness of the holidays kicked in. I loved this granola. I eat it alone as a snack or with greek yogurt and fresh berries. It would make a great hostess gift. I am enjoying a quiet in the aftermath of Christmas. This time of year always makes me reflective. How about you? What is on the top of your list for next year? Combine oats, almonds and wheat germ into a big bow. Add salt, and cinnamon in a medium bowl; toss well. 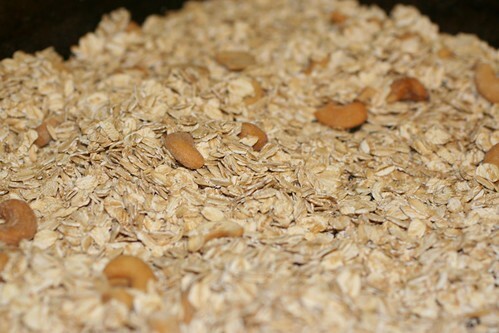 Spread oat mixture on a baking sheet; bake at 325° for 20 minutes or until lightly browned, stirring occasionally. Remove mixture from baking sheet; stir in currants. Cover a baking sheet with parchment paper; coat paper with cooking spray. Combine cranberries, sugar, molasses, canola oil, and vanilla extract in a small saucepan over medium heat. Cook 4 minutes or until sugar dissolves, stirring frequently. Pour the cranberry mixture over the oat mixture, tossing to coat. Spread the granola evenly on prepared baking sheet. Bake at 325° for 15 minutes or until the mixture is lightly browned. Remove granola from oven, and cool completely. Break into small pieces. 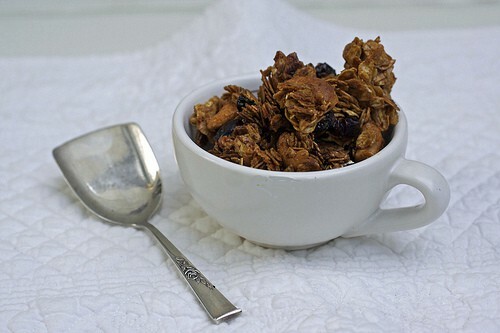 Store granola in an airtight container in the refrigerator for up to 2 weeks.